Diamond Education | Know More About Diamonds In This Blog Online. When it comes to Diamond Education we try to educate our viewers to deliver the best knowledge regarding the diamonds. If you are going to buy diamonds and you don’t have enough knowledge about how to buy and what to buy then you should have proper Diamond Education. This blog is to Educate the one who is about to purchase diamonds and love diamonds. Diamond education is necessary for purchasing any diamond accessory or jewelry. At Gemone Diamonds, we adhere to the highest standards while making each diamonds. Gemone Diamonds make diamonds with perfection to fit them in any type of diamond jewelry. Our collection consists various loose diamonds and polished diamonds. We get our diamonds tested by the GIA or with The IGI on the high standard of quality. Also, we make varieties of loose diamonds in calibrated sizes in various colors. We also make diamonds in black, purple, blue, yellow colors in round brilliant and fancy shapes. If you want them in small sizes then we can make them in small calibrated sizes too. We also make a wide variety of rough diamonds, diamond faceted beads & diamond strands. Below you will know in detail about the different variety of diamond shapes. You will know more about diamonds with the help of diamond 4 C’s clarity, cut, Carat and color. 4 C’s are the Important part of Diamond Education. Let’s learn more about diamonds in this Diamond Education Section. There are a variety of shapes made in the natural diamond industry. Unique characteristics determine quality, look, and luster of the different shape. 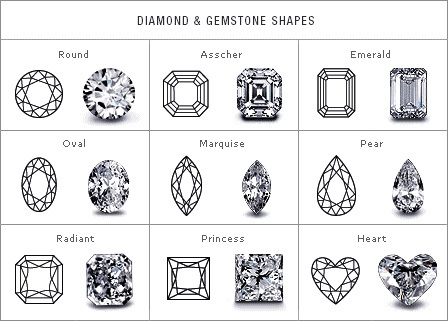 Selection of your diamond shape in very important. If you are choosing the diamond for your jewelry then you must be aware of diamond shapes. If you have more questions while choosing, then feel free to mail or contact us, We are here to help you. The Round brilliant cut diamond is the most used and always in demand diamond shape in the industry. For almost 10 decades, diamond cutters been using innovative theories of light imitating. To improve the fire and brilliance in the round diamond they tried various theories. A round shape diamond gives us the utmost flexibility in balancing Color, Cut, and Clarity. While you will get the one of the highest fire and brilliance in it. Princess shape diamond is the highest sought out shape diamond after round diamond. It’s the second most preferred shape due to its brilliance and unique cut for diamond jewelry. The Princess shape diamond has pointed 45-degree corners and is squarish in shape. One of the unique things in princess-cut diamonds is that it can vary in any square or rectangular shape. This is the fact due to improving the yield in the polish weight. Here is the length to width ratios for Princess Cut diamond shapes. While choosing Princess diamond for the jewelry, always go for the square shape. Look for the length to width ratios between 1.00 and 1.05. If you prefer more of a rectangular shape to fit in your jewelry choose for length to width ratios more than 1.10. For the most brilliant princess available, check out Gemone diamonds certified diamonds page. What makes Emerald shape diamond is its pavilion part which has rectangular facets. It’s like step cut to create a finest optical appearance. Due to its wide open table, emerald shape highlights the clarity of a diamond. If you are choosing an emerald cut with the lowest quality like SI grade then you must check it’s clarity. The clarity will be visible on the certificate that you will get with the diamond. Why I told you to check the clarity is because inclusion in the table is a strict NO. Also, emerald-cut diamonds can vary in how rectangular they are. If you’d prefer an emerald cut with a square outline, look for an Asscher-cut diamond instead. 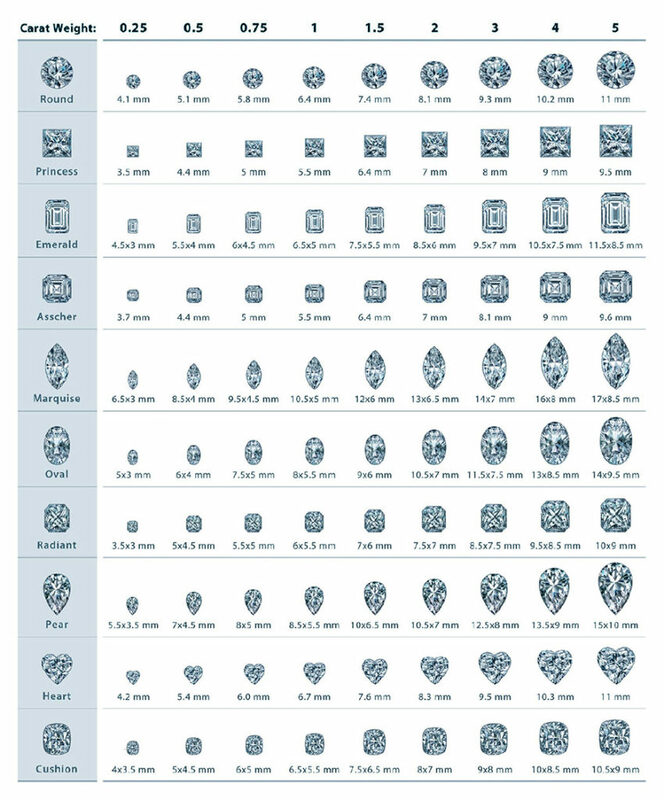 To find the shape of emerald you want as per length to width’s ratio you can check our diamond size chart. The length to width ratio will determine the diamond’s outline. Even you will get to know how it will look when viewed from the top with the help of length to width ratio. For the brilliant emerald-cut shape, look for a length-to-width ratio between 1.30 and 1.40. You can check few of our Emerald Cut Collection On our Certified Fancy Shape Diamonds Page. This unique shape is identical to the emerald-cut, except that it is square. Also, the pavilion of this shape is similar as emerald cut with rectangular facets in the same style. If you choose the SI clarity then make sure you will view the clarity of the diamond certificate. Because this shape highlights the clarity of the diamond. When choosing a color grade, consider that while the price of a J-color fancy shape is exceptional. Color may be visible in its corners. All Asscher cut diamonds From us will appear square because each one is from 1.00 and 1.05 in length to width ratio. For our ideal Asscher-cut diamond, view the Gemone diamonds Certified Collection. The shape of a marquise diamond can maximize Carat weight which makes it larger it looks. As per my opinion, this diamond looks better with round or pear shape accent. And the length of the marquise makes the fingers appear long and slender. To find dimensions of the marquise you got to look for the length to width ratio. The length to width ratio will determine the diamond’s outline or what it will look like from the top. For the most traditional marquise cut diamonds, look for length between 1.75 and 2.25. An oval diamond has a beautiful brilliance that’s like a round diamond. Oval diamonds are also very popular as their length can stress long, slender fingers. To find the dimension of oval you want looks for the length to width ratio on our website. The length to width ratio will determine the outline of the diamond or what it will look from the top. This brilliant-cut diamond is also called a teardrop for its single point and rounded end. The unique look of the pear shape helps make it a popular choice for a variety of diamond jewelry. If you choose an elongated pear shape, the length of diamond creates a slimming effect on fingers. To understand what the diamond will look like from above check for length to width ratio. For the most traditional pear-shaped diamond, look for a length-to-width ratio between 1.45 and 1.75. The heart shape is the ultimate symbol of love. The unique look of the heart-shaped diamond makes it a distinctive choice for jewelry. When choosing a color grade consider that the price of a J color is exceptional. You can see visible colors in its corners. To find the dimensions of heart page do check for its length to width ratio on every page while buying online. The length to width ratio will determine the outline of the diamond or what it will look like from the top. For the more traditional heart-shaped diamond look for a length to width ratio between 0.90 and 1.10. This unique shape has been popular for more than a century. Cushion cut diamonds are also known as “Pillow cut diamonds”. They have rounded corners and larger facets to increase their brilliance. These larger facets highlight the clarity of the diamond. 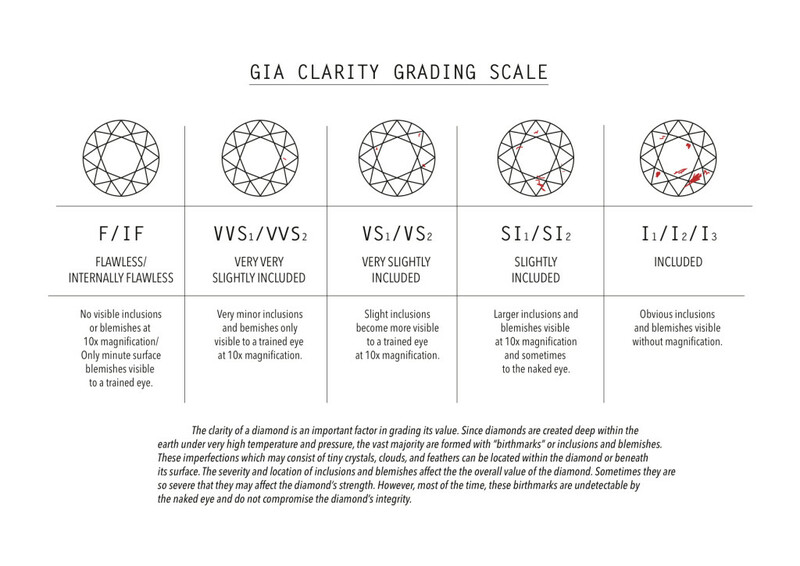 So if you choose an SI clarity grade to be sure to review the clarity plot of the diamond certificate. Cushion-cut diamonds are available in shapes ranging from square to rectangular. To find the cushion cut diamond of your choice you must check the length to width ratio. You can check it on our website too. The length to width ratio will determine the diamond outline, or how it will look from the top. For a cushion-cut diamond that is square, look for length-to-width ratios between 1 and 1.05. If you prefer more of a rectangular shape, look for length-to-width ratios greater than 1.15. Clarity is the measure of the number and size of the tiny imperfections that occur in diamonds. Many of these imperfections are microscopic and do not affect a diamonds & beauty in any way. You will know much from diamonds clarity but of all the 4 C’s it is easiest to understand. According to many experts diamond’s clarity has less impact on a diamond’s appearance. Clarity stands for the tiny imperfections that occur in all the finest diamonds. In technical names, Gemologists refer it as blemishes, inclusions, and many others. Diamonds with the least and smallest imperfections receive the highest clarity grades. As these imperfections tend to be microscopic they do not affect diamonds beauty anyway. Which diamond clarity is right for me? * Select an eye clean diamond one that has no imperfections. Visible to the unaided eye through the crown. Diamonds of this clarity are less expensive than FL to VVS1 diamonds. Them prices are rare and command higher prices. * Imperfections in diamonds grade with (SI 1/2) are not visible to the naked eye making them valuable for money. For further guidance of SI1 Quality diamond, you can mail us or call us on given contact number on the website. We will help you from which one to choose. Most of the online retailers offer SI1 To I3 grade diamonds. Although the picture may or may not depict the actual product they are selling. Every diamond clarity has its own price, So most of the people are being fooled here. So it’s requested you must buy from genuine sellers and make sure what you are buying. We offer almost every quality of loose diamonds. Every quality has its own price and value. * A cut is diamonds Important characteristic. As a Gemologist, I will recommend to you to select highest cut grade that fits your budget. The reason is simple: of the Four Cs, no other character has a greater influence on a diamond’s appearance. A diamond’s cut grade is an aim measure of a diamond’s light performance, or, what we generally think of as sparkle. When the cut of a diamond is in proper proportion the light reflects out of the diamond. Gemologists prefer this as the table. If the cut is too shallow light leaks out of the bottom too deep and it escapes out of the side. Which diamond cut grade is right for me? For the best ideal cut look for the Ideal or Excellent Cut. For the best possible cut, look for the Ideal or Excellent Cut. Each higher cut diamond is hand-selected and cut to the most exacting standards. This guarantees one of the finest cuts available in the world. Diamonds with a good or very good cut grade represents a combination of beauty and value. Contact us to know more about the cut, including its fire, brilliance, polish, symmetry,.etc. Most of the online retailers offer very well to fair grade diamonds. Although the picture may or may not depict the actual product they are selling. Every diamond clarity has its own price. Most diamond companies online fool people online with fake pictures. So always ask for real pictures while buying online and must be sure of what you are buying. We offer from Ideal to Good Cut of loose diamonds, on the fact that every quality has its own price and value. A unit of weight for a diamond. Equal to 200 milligrams, or one-fifth of a gram. * Carat is a measure of a diamond’s weight and by itself may not reflect a diamond’s size. * We check diamond from the top because that is how diamonds look like to use when they are set in the ring. * Consideration of diamonds weight is necessary if one wants to understand its size. Diamond conjunction with two other criteria is necessary as shown below. Distance in millimeters across the top of the diamond. This print out illustrates how diamonds of different Carat weights will appear from the top. The distance across the top of the diamond measured in millimeters. It is important to measure the distance across the top of the diamond as this is how we view a stone when set into a ring. Diamond cut is also taken into consideration. Because when the diamond cut is proper in proportion it reflects more amount of light from the top. Thus, when a diamond is well cut, the light reflected out of the top makes it appear larger. Also much of the weight of the cut diamond, hidden in the base of the diamond. Making the diamond looks smaller from its actual Carat weight would imply. It is thus possible to have the diamond of a lower Carat weight but higher cut grade. That appears larger than a diamond with a larger Carat weight, but poor cut. Once you are sure with your Cut, Color and Clarity grade it will become easy for you to choose your diamond. Much as there are 100 pennies in a dollar, a One Carat Diamond compromises of 100 points. Hence, 50 points are equal to 1/2-carat, and so on. Which Carat Weight Is Right For Me? To choose the best Carat weight, consider the size of the finger, the size of your setting, and your budget. Are you looking for a Large Carat weight diamond? and Is it still not fitting into your budget? 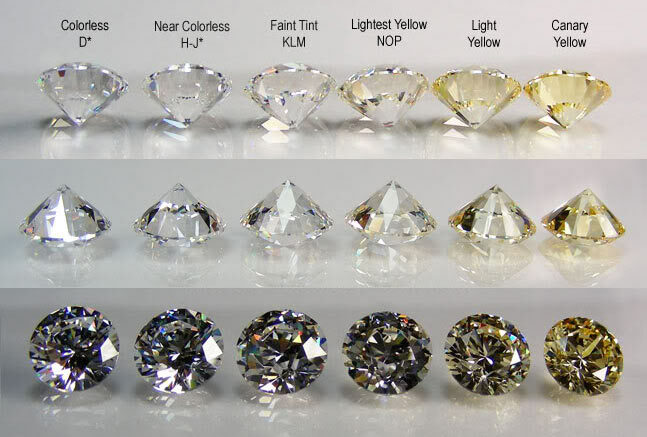 Then you must consider a diamond with good cut and SI1-SI2 clarity and in I or J Color grade. Diamond prices jump at the full and Half-Carat weights. Diamonds bellow this weight costs less. Small size differences are impossible to detect. As the distribution of Carat weight is the entire diamond. Not all settings will fit all diamond Carats or shapes. If you have already selected a setting, check the diamond specifications of your ring or ask us for help. If you have any special jewelry customization request feel free to contact us. We can make almost every type of diamond jewelry designs. Color manifests itself in a diamond as a pale yellow. This is why a diamond’s color grade depends on its lack of color. The less color a diamond has, the higher its color grade. After Cut, People consider color as the most important factor while selecting diamonds. This is because the human eye tends to detect a diamond’s sparkle first and color second. – Color refers to a diamond’s lack of color, grading the whiteness of a diamond. – A color grade of D is the highest possible, while Z is the lowest. – Gemone Diamonds only sells diamonds with a color grade of K or higher. A grade is given to a diamond to describe the subtle tones of color in a stone. D is colorless, the rarest and expensive color. As you go from D to Z on the normal color scale, it indicates increasing levels of yellow and/or brown tones. It takes trained eye under specialized lightning to distinguish between neighboring color grades. But most people can learn the difference between colors with a little practice. They can know the difference apart from several grades. At Gemone Diamonds, you’ll find only the finest diamonds. One with color graded D-K. Diamonds graded K or better are colorless or near-colorless. And the one with color that is undetectable to the unaided eye. I really wish now you got to know from this diamond education blog and you must have realized how important is diamond education. Our aim for our customers is that they must know Diamond Education before purchasing anything online or from your nearby store. So, That’s all from our Diamond Education Blog If you would like to know more about diamonds and any unsolved queries you would like to ask then you can mail us for sure. Diamond Education is Important and the most important thing is to Educate your Viewers or Customers about Diamonds.